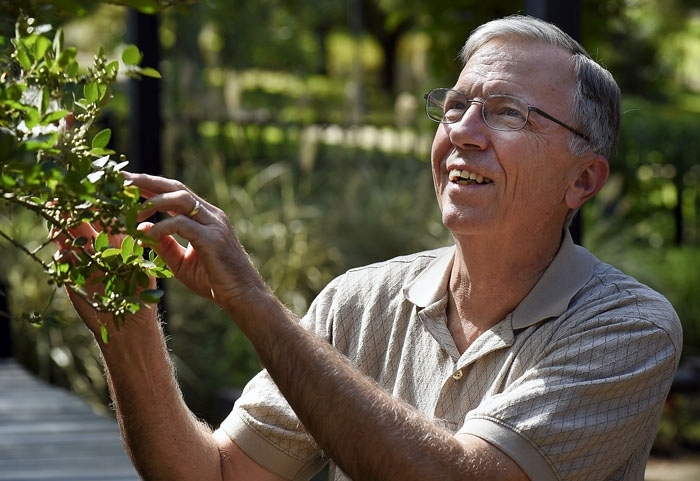 Horticulture and gardening has been a Hansen hobby for at least 3 generations. My grandfather, whom I never knew, was born in 1868 In Germany, emigrated to the United States in 1875, and eventually became an attorney in Cleveland, Ohio, about whom it is written in "A History of Cleveland and Its Environs"
All his life Mr. Hansen has been a great lover of the outdoors, and on his grounds are planted specimens of every native tree that grows in this section, about every hardy tree of the country and some of them nearly seventy years old, and a wealth of vines, hedges, bushes and shrubbery of every kind. While at college he taught botany and geology and he has retained in full degree his love for flowers and all growing things. My father said the part about having "every native tree" was an exaggeration, but such a reputation doesn't come out of thin air. He always had a garden and fruit orchard in his homes, as did my father. My earliest memory of gardening is walking down the flagstone pathway towards the garden at the end of the property and my dad asking me the name of a flower as we passed. "I don't know" was my reply. "I just told you", he reminded me. I still have no idea what the flower was, and had no interest in gardening until much later in my college days. My career started 40 years ago as an employee in retail garden centers as a landscaper and retail sales in Austin, Texas, eventually helping friends start a new retail nursery. A few years later, I returned to college to pursue a degree in Horticulture at Texas A&M, receiving my Batchlor and Master's degrees in Horticulture. I continued my study in Plant Physiology at the University of California at Davis, where I experienced gardening in a totally different climate from Texas. I was an Extension Horticulture Agent for Texas A&M AgriLife Extension Service for 29 years, working in both Corpus Christi and Tyler, Texas. As an educator and consultant, I learned practical applications for a wide range of horticultural and gardening topics, working with a diverse range of clientele from homeowners with no previous gardening experience, to Master Gardeners, to retail and wholesale growers. These cumulative expriences since 1973 have enabled me to bring expert advice covering landscaping, vegetable and fruit production, and most things in between to the folks I've been helping, to make the best choices and decisions for their own gardens, by relying on proven research with real-world solutions that work.